Today's decluttering mission is to declutter vases and flower pots. This seems like the perfect mission for spring, since flowers are finally starting to bloom! We often accumulate those cheaper vases you get from the flower shop when a bouquet is delivered on holidays and special occasions such as Mother's Day, birthdays, anniversaries, or just because. If you only have a few vases, and you use them consistently, this isn't really the mission for you, since I'm not saying to get rid of all of them! But for many of us those cheaper vases that I mentioned above begin to accumulate over time. 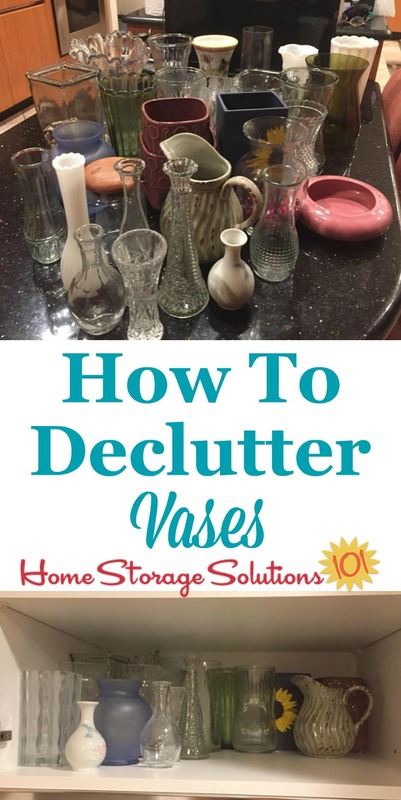 You need to be realistic and know that there are just so many vases you can use at one time, so having a whole lot of them isn't worth the space they take up. Decide how many you will keep, keeping in mind both the space available and how often you really will use these vases, and how many you could practically use at once. The prime suspects to declutter are inexpensive ones, ones you don't like, or any above the number you've chosen as being a reasonable amount to keep. 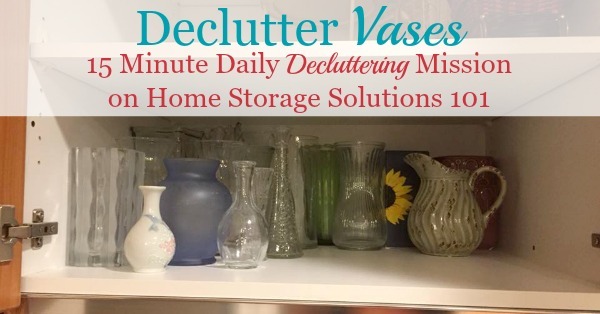 Below I've provided some inspirational pictures from readers who've done this mission, including a few ideas for where to donate these vases, if you're stumped, and also a few alternate uses for them around your home beside for holding flowers. 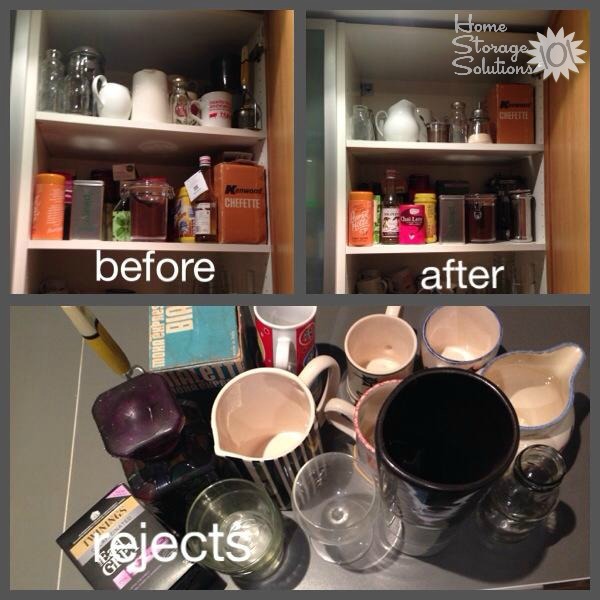 A reader, Fiona, sent in the photo above showing off the before and after of the kitchen cabinet where she held vases, along with several other types of items. She said, "I did the tea/ coffee shelf and the one above which has jugs and small vases. Now that my eldest daughter has started drinking tea and coffee we need more space. It's not easy to see much difference from the before and after pics but believe me getting rid of stuff from the back of the top shelf has made it all much better." Similarly, here's another before and after photo set, sent in by a reader Mardi, after working on this mission. Mardi said, "It is a tribute to my husband that I had 25 vases in the cabinet — a result of the flowers he has sent to me for various occasions. I forgot to take a before pic, but here is what I took out of the cabinet, and the after. I’m noticing a pattern — I never get rid of as much as I should. I could still cut what I keep by at least 50%, but for me it’s a big step to get rid of anything!" Great job Mardi! I'm proud of you for what you've accomplished! If you've found yourself with too many vases to actually realistically use regularly, you've got a couple alternatives, the main two being donation or repurposing. 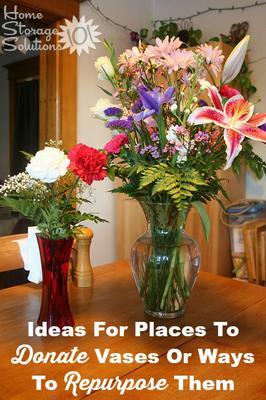 Here's ideas below for what you can do with your excess vases. As with most decluttering projects, one of the easiest ways to get rid of your clutter is to donate it, hopefully to someone who will appreciate it and be able to use it. As always, you can donate vases to thrift stores who can then give them to those in need, or resell them. But there are other more creative places to donate as well, and I know it can feel good to give something to someone that can really appreciate it. Think about what places get a lot of flowers delivered, but perhaps not with vases. The two that come to my mind include hospitals and nursing homes. When someone gets a bouquet without a vase having some extras on hand can be helpful. Always check first though before dropping off any donations to such places to make sure they can actually accept and will appreciate them. 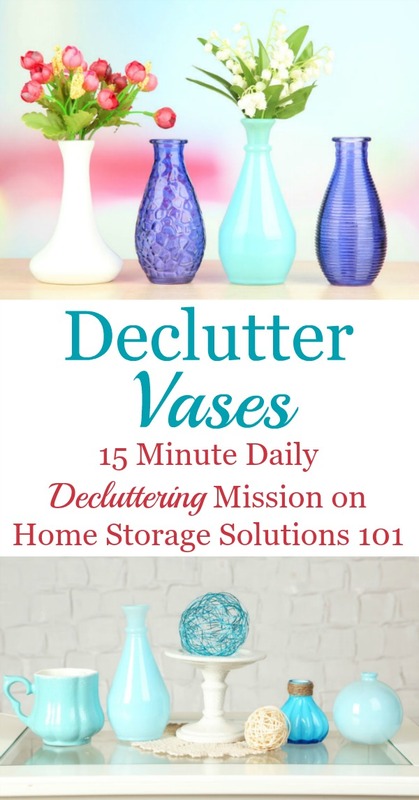 Another creative idea mentioned by several readers who've already done this mission is to just give some of these vases back to your local florist. It cuts their cost, and is the ultimate in reusing since obviously floral shops do often deliver their orders in vases. I'd love to hear even more ideas from you below, in the comments, about places to donate these objects. Obviously vases are designed to hold flowers, which are typically long and thin. That means you can often use vases in your home for storing or organizing other objects that have basically the same shape. Most of these ideas work better with smaller vases, because the taller the vase the less likely you can find objects long enough to actually fit without just being engulfed. 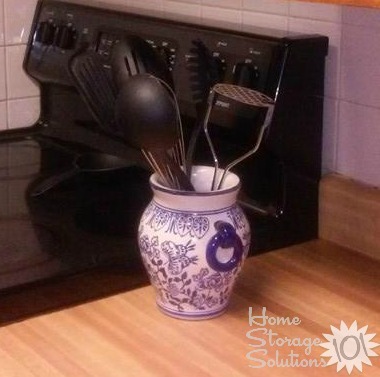 But that being said, often people will use a pretty vase as a utensil crock to hold frequently used cooking utensils close to the stove. In fact, that's exactly what a reader, Rolonda did when she did this mission, and she sent in this photo to the right. She said, "And here's the vase I'm using to hold my cooking utensils. I can't wait to declutter my cabinets and drawers next!" Similarly, you could use a vase to hold your makeup brushes in the bathroom or on your vanity, or in your home office to hold some pencils and pens. Another reader, Linda, used her old vases for displaying sentimental collectibles. She explained, "Tossed out broken vases! 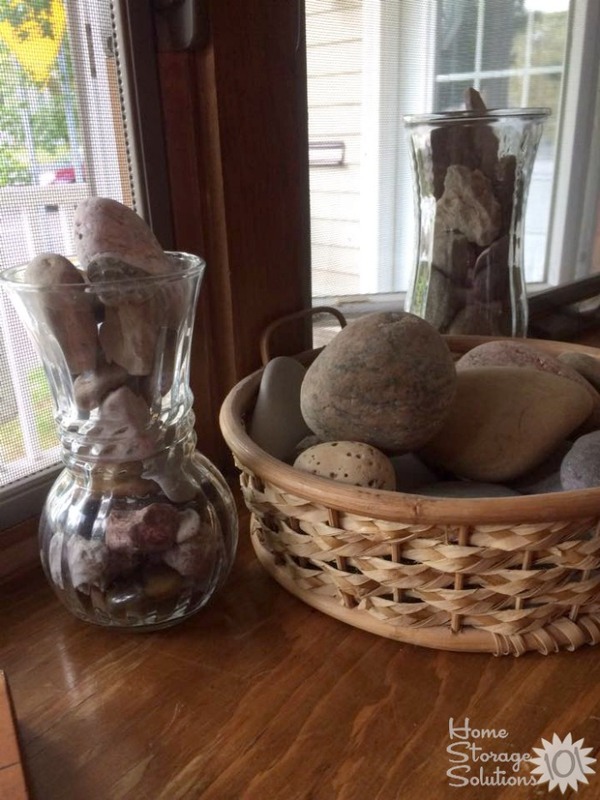 I was taking cracked vases and 'repurposing' them to hold/display the various pebbles/stones/rocks gathered up by my son and gifted to me over the years! Since the vases were not going to be able to hold water for flowers, thought this would be another use. This mission gave me pause for thought, should one of the cracks give way, what a mess that would be of broken glass. I replaced the vases with intact ones, the others are in the recycle bin. As I come across broken items will be realistic on if it's actually repairable/safe to repurpose." I'd love to hear more ideas from you below, in the comments, for ways to repurpose and reuse vases so they don't go to waste. After all, you may not get flowers too too often, but if you really love a vase you might discover a way to have it out on display basically all the time so you get to enjoy it more! 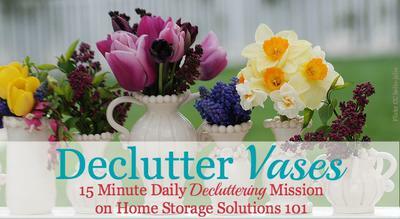 I hope this mission has inspired you to remove excess clutter from your home. Saw this in a restaurant and copied it: attach a pen to an artificial flower with floral tape and put in a bud vase. Keep one on your table, desk, counter, etc. So pretty and useful. You and I must have been on the same wavelength Taylor. The difference being that you have suggested a de-clutter of vases while I on the other hand have had a clumsy couple of weeks and broken two glass vases, a mug and two cups!! Those that are lucky enough to have an agriculture teacher in their high school can contact the school to see if one of the classes is horticulture. Our teacher has the class do some floral design and many students bring them to their parents. Donating extra vases helps the teacher stretch the budget. For the vases that come with bouquets from the florist, I just put them through the dishwasher and drop them off at the florist. They can use them again. Every so often the florist in our town puts out a sign that if you bring in a vase you get a free bouquet of flowers. That makes it worth the stop to recycle vases. My son likes to build things and has recently been turned on to bird feeders. While searching the web for easy bird feeders, there are several plans that use glass/ceramics (teacups, bottles, mason jars). A vase could easily be adapted into some of these plans. Since I grow so many flowers in my yard, I make a bouquet and give it away in the extra vases. Make someone's day! I often receive flowers from friends and family when I perform at the theatre, and I am always looking for a vase to put them in when I get them prior to the show. Perhaps theatres would like to get vase donations, although you should definitely call first to see if they are interested or have space to store them. They can also be used as props in theatrical productions. We bought a tall white vase shaped like Mickey Mouse's head years ago as it was on sale. We decided to use it instead of the smallish ceramic jar for all our cooking utensils, as we had more then what the jar would hold. It sits on the counter next to the stove so it's very handy when we're cooking. We have regular & slotted spoons, a ladle, a fork, spatulas & tongs. Everything is black or white & except for the tongs, they're all plastic. The 2 "ears" hold the tongs, with one side hanging out & the spatulas. The "head" holds everything else. There's plenty of room and it's easy to grab the exact item we want. The vases always come in handy for decorating the tables at special school functions, including Volunteer luncheons, sports banquets, etc. There was a shelf in the front closet almost full of vases I discovered while helping dad clean out after mom died. Dad did not want to get rid of all of them because he wanted to take flowers to people he visited in the hospital. I put the nice vases on one side and the inexpensive, florist ones on the other side and got rid of several more. When my dad died several years later, there were only 3 vases left on the give away side. We had a large staff at work. I would purchase flowers and use the vases as birthday gifts for them. For years and years my church weekly puts the alter flowers in the vases for home bound or those in the hospital. This was one easy 15 minute day for me. I found only two to take to the church. I repurposed a ceramic vase to hold the toilet brush. The Florist I use utilizes nice but older vases for his masterpieces. I always take those extras to him and leave with a couple flowers for my home. Great deal for me. Then those inexpensive vases that clutter up the shelves, well I take mine to the church for the volunteers that distribute the alter flowers to the hospital patients or home bound members. Occasionally, I even buy a few more at the thrift store when they are on sale for my church.